This photo taken by NASA's Lunar Reconnaissance Orbiter (LRO) shows high sunlight reflecting off the moon's Aristarchus crater. Spectacular new images of a gigantic crater on the moon were captured recently by a low-skimming NASA satellite. In November 2011, the space agency's Lunar Reconnaissance Orbiter (LRO) spacecraft passed over the moon's Aristarchus crater, which spans 25 miles (40 km) and sinks more than 2 miles (3.5 km) deep. Photos and video of the crater from LRO's sweep were released Dec. 25. The huge and highly reflective Aristarchus is easily visible with the naked eye. But the details shown in the new photos are a special treat from an extremely low flyover by LRO. "The spacecraft was only 26 km (16.2 miles) above the surface; about two times lower than normal," Mark Robinson, principal investigator of the Lunar Reconnaissance Orbiter Camera at Arizona State University, wrote in a NASA post. "For a sense of scale, that altitude is only a little over twice as high as commercial jets fly above the Earth!" 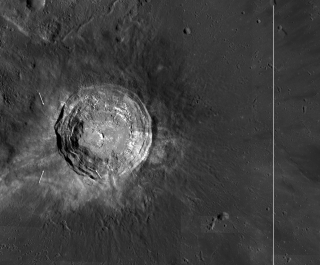 The west wall of the moon's Aristarchus crater seen obliquely by NASA's Lunar Reconnaissance Orbiter (LRO) from an altitude of only 16 miles (26 km). The spot offers some fantastic, and scientifically interesting, scenery. "The Aristarchus plateau is one of the most geologically diverse places on the moon: a mysterious raised flat plateau, a giant rille carved by enormous outpourings of lava, fields of explosive volcanic ash, and all surrounded by massive flood basalts," Robinson wrote. Scientists think the crater was created relatively recently, geologically speaking, when a comet or asteroid smashed into the moon, gouging out a hole in its surface. NASA launched the Lunar Reconnaissance Orbiter in 2009 on a $504 million mission to map the moon in unprecedented detail. The spacecraft is about the size of a Mini Cooper car and carries seven instruments to study the lunar surface.